Corbeau Fixed Back Seat - Clubman UNIVERSAL - Dezod Motorsports Inc - Home of the automotive performance enthusiast since 2002. 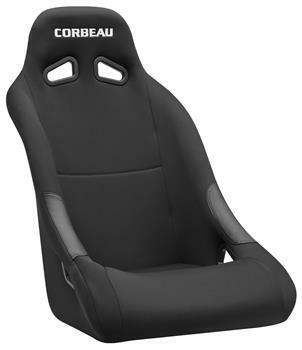 The Corbeau Clubman Racing Seat is an entry-level seat that is ideal for the weekend enthusiast. Whether on the street, off road or on the track, the Clubman provides an ultra aggressive look and feel without breaking the bank. Standard features include: tubular steel frame, molded foam, integrated full body support, 5-point harness capability, and leatherette high wear patches. The Clubman will fit up to a 36” waist. Available Colors: Black Cloth, Blue Cloth, Red Cloth, Yellow Cloth, Grey Cloth, Black Vinyl.